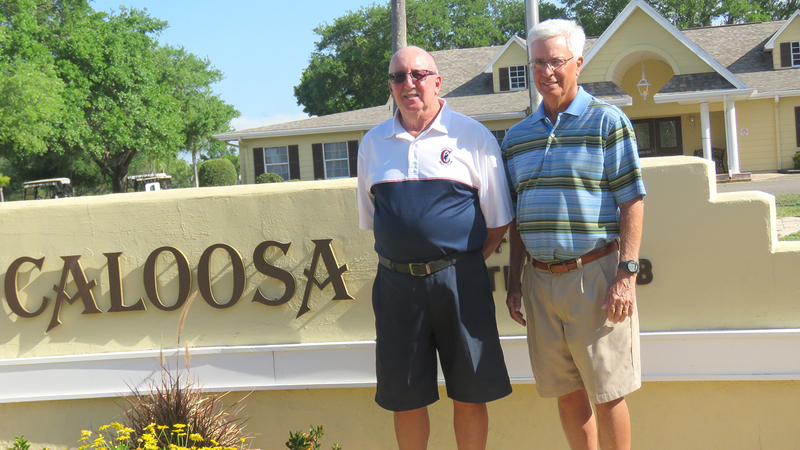 Caloosa Golf and Country Club President Joe DeFelice (L) and Director of Marketing Jim Walters are both new to their posts this year and are looking toward the future, targeting member growth from the current 303 to 350. Birthdays are always special, and in March, Caloosa Country Club celebrated its 40th as Sun City Center’s only member-owned golf and country club. The 18-hole course covers 177 acres on Pebble Beach North, with 137 of that land; the remaining 40 is water. The Club has an interesting history. Its name and logo originate from the Calusa (kah LOOS ah), a Native American people of Florida’s southwest coast who died out in the 1700s. The property, when purchased in 1979 from Sun Mark Homes for $1, was a tomato farm. Sun Mark later returned the $1 bill with the stipulation that it remain displayed in the clubhouse — which it is. The first membership drive, spearheaded by Shirley and Jerry Peeler, raised $3,500 each from 300 members to build the club’s course and clubhouse. Shirley Peeler remains a member of the club; her husband has since passed. There is one more still-active member from that first roster—Roy “Howdy” Long. He is called Howdy because that’s the way he greets people since he can’t remember their names. Long will be celebrating his 100th birthday in May with a party at the club. 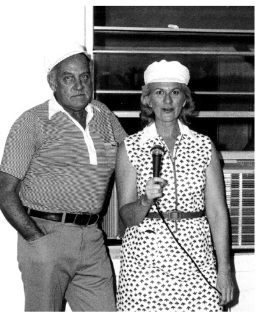 Forty years ago, Jerry and Shirley Peeler led the first membership drive, which raised funds for building the club in 1979. Jerry has since deceased, but Shirley is still a member of the club. Long enjoys reminiscing, especially about how he was instrumental in introducing the club’s refreshment bar in the early days. They have a limited license to sell beer and wine and operate the bar on an honor system. (Beer costs $1). President Joe DeFelice said that the bar is popular because they don’t have a restaurant or “real” bar. “A lot of clubs get into financial difficulty because they can’t support a restaurant or bar,” he said. Caloosa’s newest members, Doug and Brenda Graber from Apollo Beach, couldn’t be more pleased. The Grabers joined Caloosa in March and found immediate acceptance into what they call a very welcoming atmosphere. “We’ve moved around a lot and seen a lot of clubs. This is my favorite, and the biggest reason is that it is member owned, so members control the things that go on. The club has several different groups and a lot of social functions and, frankly, it is just fabulous,” said Doug. DeFelice said the club is debt-free with a significant capital surplus, and the board is actively seeking member input about the club’s operation. “You hear a lot about golf dying, but we are looking toward the future, and a lot of ideas are floating around,” he said. They acknowledge that the average age of their 303 members is around 74, and they are attuned to health, so a six-hole walking course is one of the projects being proposed. The Caloosa self-contained course is rather unique. There are four loops of four or five holes with clubhouse access at the start and return of each. That allows stopping for beverages, snacks or a restroom break after each loop. Over an acre of the property is dedicated to practice—two putting greens, one driving range and a pitching area with two sand bunkers. As the club’s new director of marketing, Jim Walters will be working on member growth and retention with a goal of 350. Minimum age for membership is 50 and anyone can join; there is no SCC residency requirement. He estimates that 10-20 percent of the membership comes from surrounding communities. For more Caloosa information, visit them on the web at golfcaloosa.com.